Emmaus had his first day of school on Wednesday. He had been asking to wear his uniform every day for two weeks previously. He did very well at his first day. I realize now though that the two of us need to learn the words to the Filipino national anthem as they sing it every morning! Looking very handsome in his uniform. 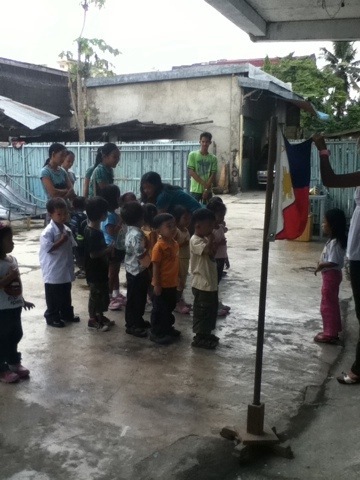 Hands on heart for the National Anthem. He is SO adorable. 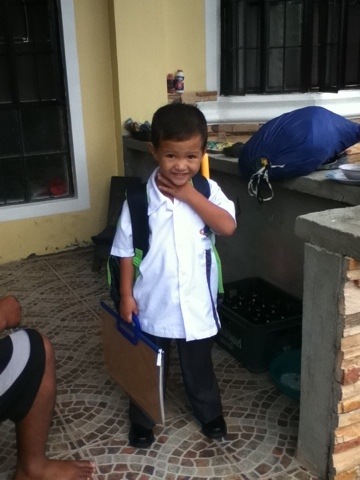 I simply can’t believe that he’s off to school. Time passes to fast. He is adorable. And so big! Didn’t you just have him 2 – 3 years ago?! I don’t know if you heard, but we had another baby this year and I chose to use a midwife and have a home birth. It was fabulous! I hope you’re finding your work fulfilling as you make a difference in so many people’s lives. It was actually 4 years ago so you’re not far off! That is great that you had another baby. I knew that you did because I saw your pics on facebook- you guys make beautiful kids 🙂 So happy for you that you had a home birth. Who was your midwife? Shannon Ruley from Mission Midwifery. She was great!